There will be celebrations for the Day of the Dead, the XXII International Gourmet Festival, the 2nd Guayabitos Extreme Triathlon, the 8th Riviera Nayarit Half Marathon & 10K and the VI Motomanía San Blas. 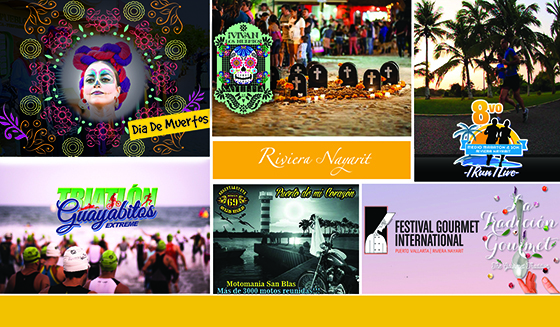 November is filled with top-notch events in the Riviera Nayarit, with the Day of the Dead celebrated in different locations within the Destination not to mention culinary events of the best kind and lots and lots of sports. Sayulita Pueblo Mágico comes alive with colorful Mexican traditions including pilgrimages to the cemetery, live music, an altar contest and plenty of festivities to celebrate the Day of the Dead. The Puerto Vallarta-Riviera Nayarit-Tepic International Gourmet Festival is one of the most important culinary events in the country. This year it celebrates its 22nd anniversary in the presence of some of the best chefs on a global level. There will be cooking demos, workshops, chats, theme nights and plenty more activities to please the palate. Want to know more? Visit http://www.festivalgourmet.com/. The 2nd 2016 Guayabitos Extreme Triathlon is set to take off on November 13 in Rincón de Guayabitos, Riviera Nayarit. The invitation is open for all triathletes, clubs, leagues, public and private associations, schools and the general public both domestic and national. The Half Marathon and 10K is of the key events in the Destination as it promotes sports, tourism and a focus on family. Nuevo Vallarta will host the event and it’s expected to be even bigger this year, as has been the case every year since it began. Do you want to go for a run in Mexico’s hottest beach destination? Visit http://www.mediomaratonrivieranayarit.com/. Over one thousand motorcycles will converge on the Historic Port of San Blas to celebrate this very special event where, among other things, there will be lots of dancing, exhibits, races and fun! For more details visit https://www.facebook.com/Motomania-SAN-BLAS-1465744890334658/timeline/.